Well, November is over. 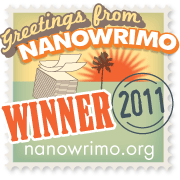 National Novel Writing Month (aka NaNoWriMo) has come to an end, and I’m proud to report that I won the challenge! In fact, instead of just writing the required 50,000 words, I went a little further and made it all the way to 60,000 words. So what did it feel like to write a novel in a month? First of all, it was a lot of fun. I spend a lot of my year writing, and November is the only month where I don’t have to do it alone. For me it’s like a Bring Your Friends to Work Month. During NaNo, there are events every couple of days where people get together to work on their novels in coffeeshops, where you can win little prizes for writing the most words during 10-minute sprints. And this first weekend in December, we’ll have the Thank God It’s Over party, where we’ll hand out certificates to winners, and share some of our best and worst sentences from our novels. Looking back over the month, I feel proud of all that I accomplished. I dreamed up what our world will look like in the future, and peopled it with some very interesting mercury toxic characters. I wrote great scenes that I never knew I had inside me. I wrote more words that I have ever written in a 30-day period. 60,000 words into this first draft, the story is just getting going. I still have half of it yet to write. So what should I do? Thank God December is NaNoFiMo–That’s National Novel Finishing Month. It’s an unofficial event where people write as much as they need to in December to get the rest of the story down on the page. So I’ve got my work cut out for me for the next few weeks. I’m not going to approach it at the breakneck speed of NaNoWriMo, I’m going to take it down a notch. I’m aiming to write another 30,000 words before the end of the year, and hopefully–hopefully!–that will bring me to the magic moment when I can write those wonderful little words, The End!